I am going to write a review about Mousie-Mousie, a game that has instructions printed on the inside of the box lid. I have talked about this before: I quite like it when a game can fit the instructions on the box lid. It means you can basically start playing straight away without having to spend an hour figuring out what you are supposed to do. And having instructions that fit inside a box lid does not mean that a game is shallow; my first Chess set had the instructions printed in the box lid, and no-one can accuse Chess of being shallow. 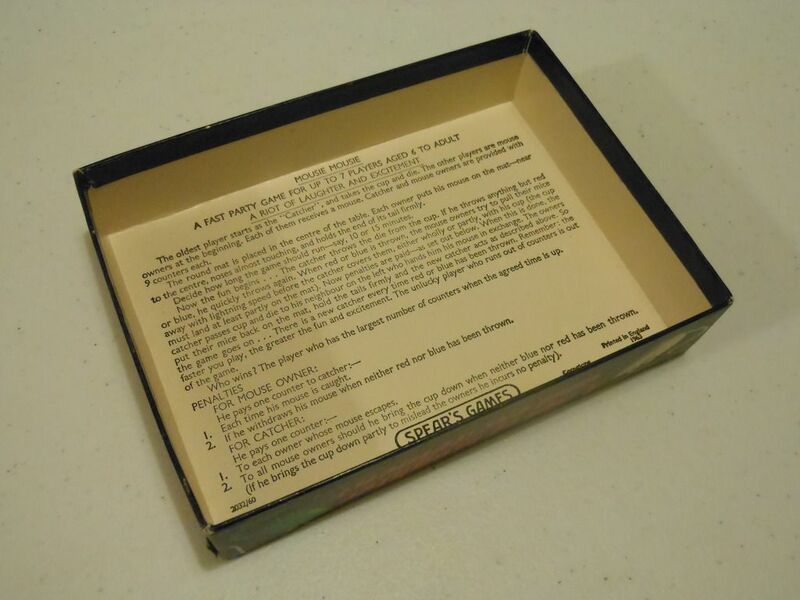 However, sometimes a game will have instructions printed inside the box lid, and that game WILL be shallow. Possibly the most shallow of all such games is Mousie-Mousie; a game so ridiculously shallow there should be a "no diving" sign on the box. Instructions in a box lid - joy! 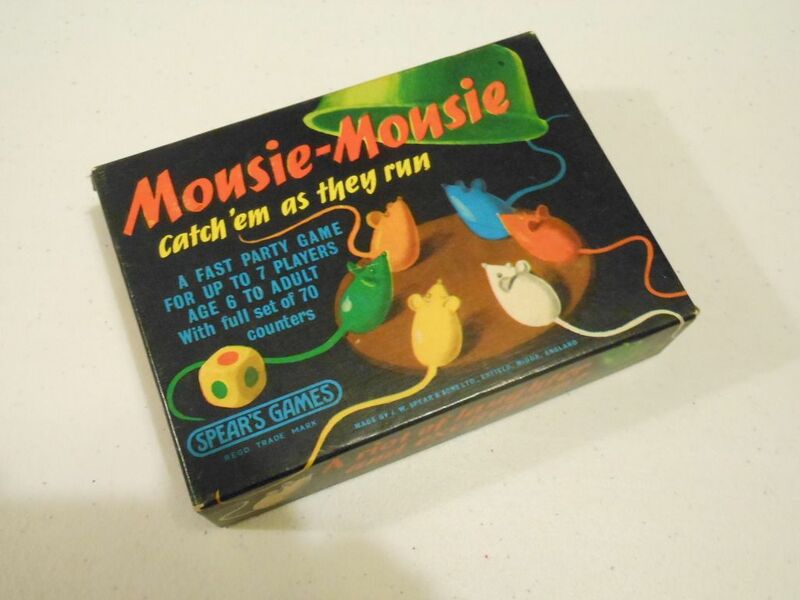 Mousie-Mousie (or Pounce, if you prefer), is a dexterity-type party game. One player gets to be the catcher and all the other players are mice. The catcher player gets a plastic bowl thing, and all the other players get nine tiddlywink style plastic counters and a plastic mouse with a very long tail. The only other components in the game are a custom dice (with colours on each side instead of numbers) and a small rubbery mat (which is usually missing from second-hand copies). Catching bowl and custom dice. The game starts with all the mice players putting their mice on the rubbery mat. The mice are positioned with noses touching, and each mouse player holds the tail of his allotted mouse. The catcher then starts rolling the dice. 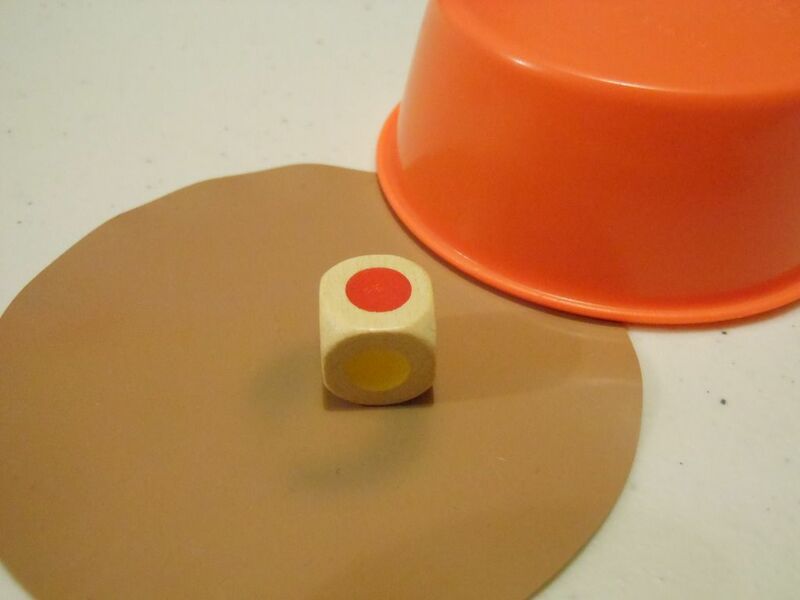 If he rolls any colour other than red or blue, nothing happens, and he should roll again; but if he rolls red or blue, he will quickly slam the bowl down and try to capture mice on the mat while all the mice players will try to move their mice out of the way. Every time the dice is rolled, you need to check if anyone needs to pay a penalty. 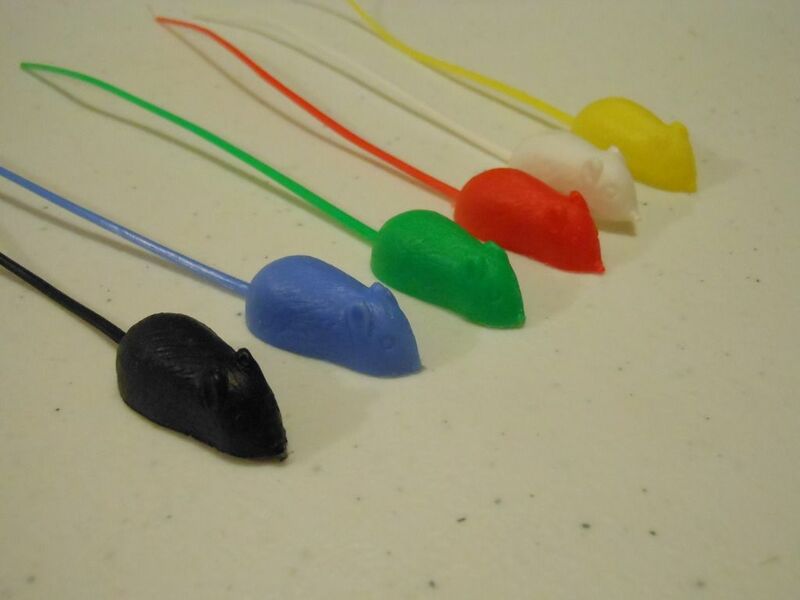 Mice players pay one counter to the catcher each time they are caught, or each time they "twitch" and move their mouse away when a colour other than red or blue turns up on the dice. The catcher pays one counter to each mouse player who gets his mouse away. He must also pay one counter to every player if he brings his catching bowl down after rolling a colour other than red or blue. I'm not kidding. That's it. That's the game. It's a very simple "twitch" game. The catcher is poised with the catching bowl, and the mice are poised holding the tails of the mice. The dice is rolled, and people have to quickly react to the result. The game claims to be "a riot of laughter and excitement." I disagree. The game instructions say you should specify a time limit to play of ten or fifteen minutes. I think five minutes is a push. This game is staying in my collection because... to be honest, it ISN'T in my collection. I bought this game for my wife, who loves it. So, I will indulge her from time to time by playing it when we have a group of friends over; but really, it's not for me. But if anybody would like to buy this game and give it a whirl, you can buy a new "retro" copy from Amazon.